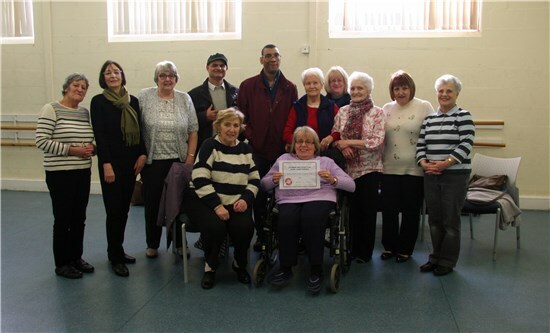 Thanks to your points donations Canley Community Centre was awarded £750 and Headway the brain injury association Coventry & Warwickshire were awarded £1250. Once you have removed the decorations your real Christmas tree can be recycled. You can drop trees off the War Memorial Park utill the 19 of January you can also take your tree to the House Hold Waste and Recycle centre on London Road. Alternatively chop your tree up and place it in your brown bin for collection with the lid closed. Your new waste calendar will be delivered over the next couple of weeks. This year there will be no collections during the 24th - 31st of December. Please check your calendar carefully for collection deatils alternatively more information can be found here. More and more people in Coventry are recycling which is great news. 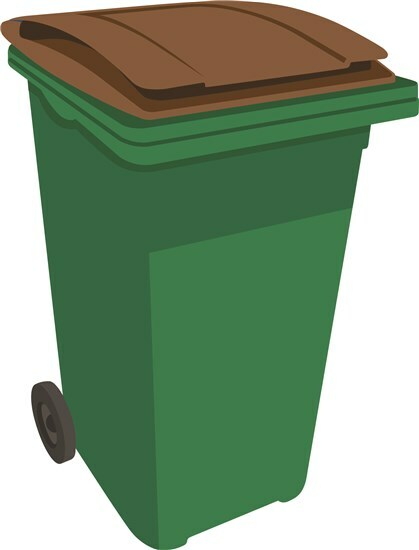 During the festive season we see an increase in waste here is our guide to help you get the right items in the right bins. If you are having a pre-Christmas clear out large items can be taken to the tip on London Road opening times can be found here. We also offer a bulky waste collection service available for a small fee more information available here. Glitter and foil wrapping papers can’t be recycled they need to go into your green lidded bin. If you’re unsure try the scrunch test to check if your paper is recyclable. If your paper springs back after you scrunch it up it can’t be recycled if it stays in a ball it can go into your blue lidded bin. You can tear glitter section off of cards before you recycle them or save them to make gift tags for next year. Plastic and glass baubles can’t be recycled. If they are in good condition you could take them to a charity shop or resell them to fund new decorations. If they are past their best please put them in your green bin or take them to the tip. Many us now shop online which will increase the amount of cardboard boxes we have at home breaking them down before placing them into your blue lidded bin will help to save space in your bin. 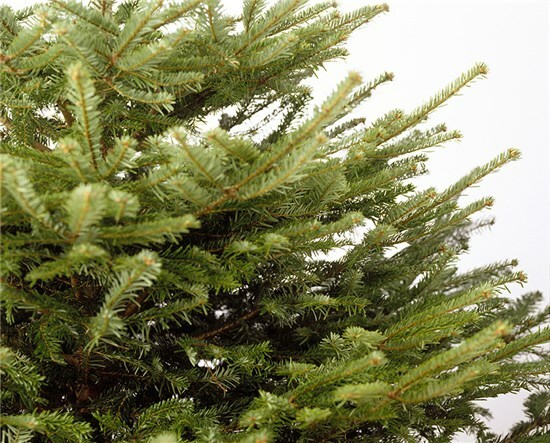 When purchasing a tree have you considered one that can be replanted after Christmas? Alternativley after the festive period you can take your tree to the tip on London Road or break the tree down to fit into your brown lidded bin just remember to take the decorations off first and ensure the lid can close. While more and more of us in Coventry are recycling there are still other items we should be thinking about. Many of us recycle items from our kitchen without thinking about it but there are many things from our bathroom we can recycle to. Try placing a bag or second bin in your bathroom or hanging a bag on the back of the bathroom door to collect empty shampoo and toiletry bottles, cardboard boxes or empty toilet roll tubes these items will soon mount up and can be recycled as part of your blue lidded bin collection. The Collins Dictionary has named Single-use as this years word of the year. Throughout this year there has been a lot of focus on single use plastics. One way you can help combat single use is to consider reusable alternatives. Often coffee shops will offer a discount for those taking a reusable cup with them into store. 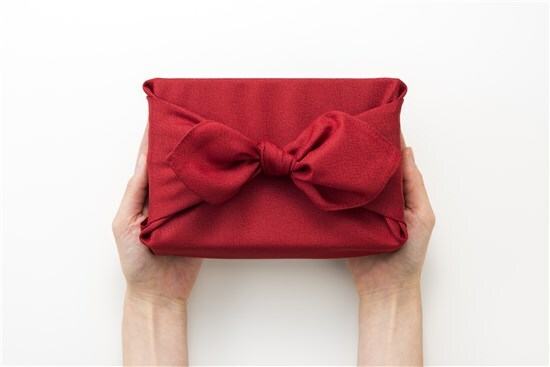 Reusable shopping bags come in a variety of shapes and sizes and can be stored in car boots, handbags and coat pockets ready for shopping trips. Consider a reusable water bottle that can be refilled is great alternative to single use bottles. Hubbub reports that 18,000 tonnes of edible pumpkin waste is thrown away each year! Truly frightening however there are lots of recipes you can try on the Love food Hate Waste website for making the most of your pumpkin. Once you are finished with your pumpkin shell you can recycle it in your brown lidded bin just remember to remove any candles first. Halloween costumes can be kept for reusing next year. You could even swap costumes with other friends. Alternatively you can make your own costume from old clothes at home and other items at home. 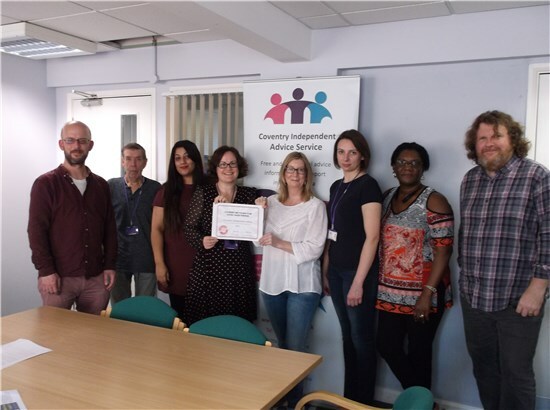 Thank you from Coventry Independent Advice your point donations allow us to give them £675 funding. 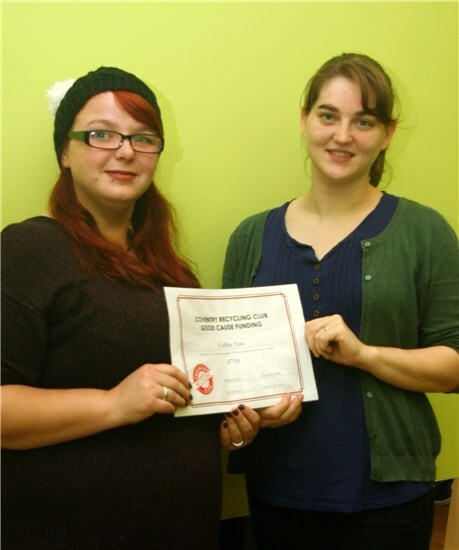 Thanks to all you points donations we've been able to award Subrang Music Therapy £450. 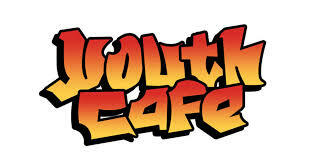 Thanks to your points donations we have been able to award Youth Cafe £1125. This has allow group members to go on holiday many of them for the first time. It’s now been a year since we changed waste collections in Coventry and more and more people across the city are recycling. Over the last 12 months Coventry has increased its recycling rate to 41% and has thrown away 17% less in their green lidded bins. You can help us ensure recycling continues to improve by placing all items into your blue lidded bin loose no carrier bags please. Make sure items like nappies, sanity products and polystyrene are placed into your green lidded bin as these cannot be recycled. If you have questions about recycling you can leave them in the comments section below. This years recycling week will take place from September 24 -30 over that week we'll be attending events to answer your recycling and home composting questions. 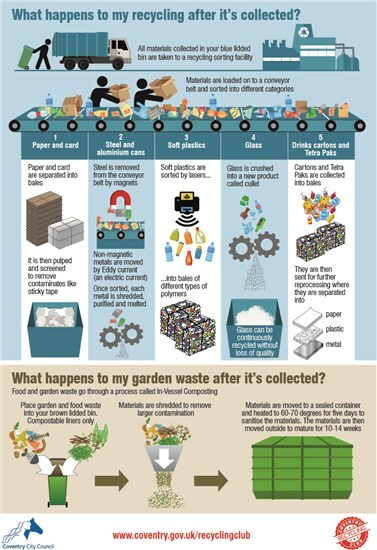 Have you ever wonder what happens to your recycling after we've collected your blue and brown lidded bins? Have a look at the diagram below for further information. All materials once collected and sorted are sent for further reprocessing to be made into new things. 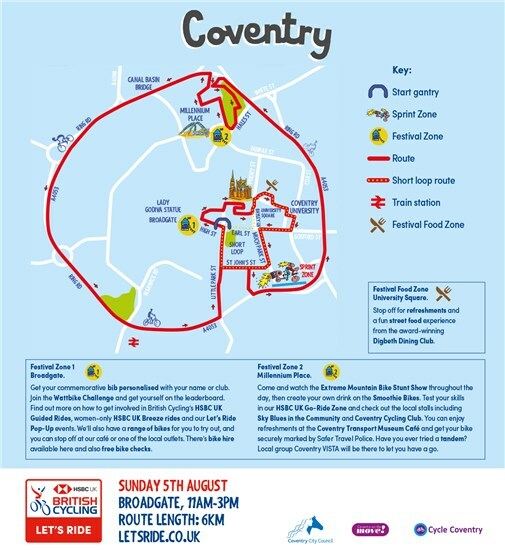 Come and find us on Sunday 5 August at the Let's Ride Coventry Event. 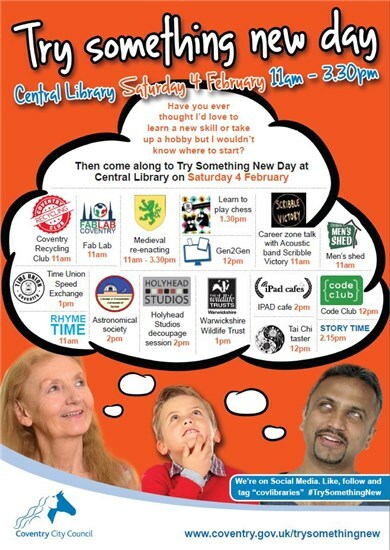 We'll be outside the Coventry Transport Museum 11am - 3pm, you can even have a go on our bin sorting game. 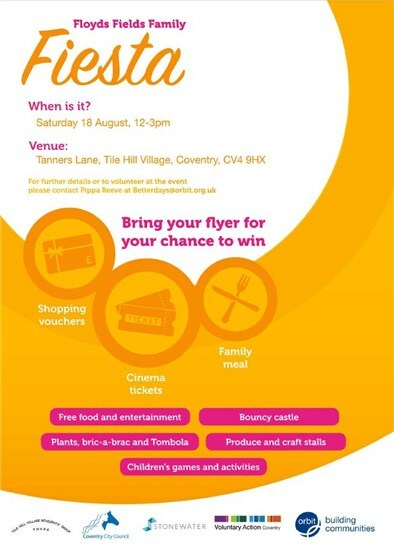 We'll be at the Floyds Fields Family Fiesta Saturday 18 August 12-3pm come and talk to us about recycling and home composting. We'll be happy to answer your questions. 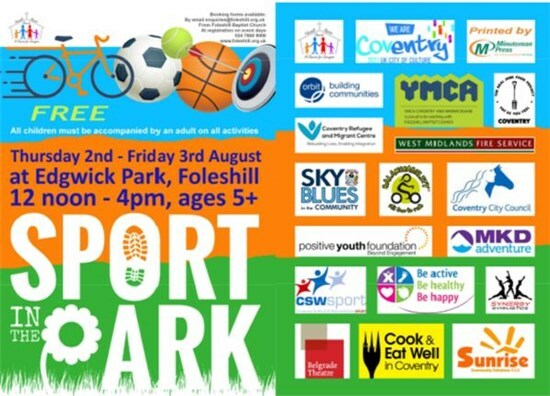 We'll be at sport in the Park on Friday August 3 in Edgewick Park. Come and ask us your recycling questions or play our bin sorting game. With so many different types of plastics on the market knowing which can go into your blue lidded recycling bin can be confusing here is a handy guide to help you. 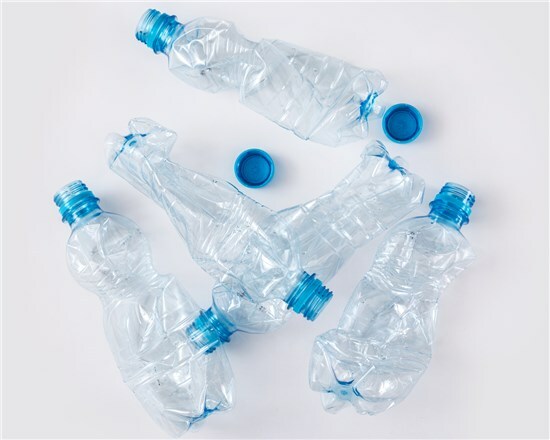 Milk bottles, drinks bottles for example water, smoothies and fizzy drinks, cleaning product bottles including those with spray nozzles, skin and body care bottles, detergent and hand soap bottles (please remove the pumps first we can’t recycle those). Please rinse bottles out before recycling them this will prevent contaminating other items in your bin with residues. Plastic trays or punnets for meats, fish, fruit & vegetables remember to remove plastic films or absorbent pads from the bottom of trays before recycling them. If you have any questions about composting at home you can come and talk to us Wednesday 9 of May at the Central Library in the city centre 11:30 - 15:30. We'll also be at the Retail Market Friday 11 of May 9.30 - 11.30. 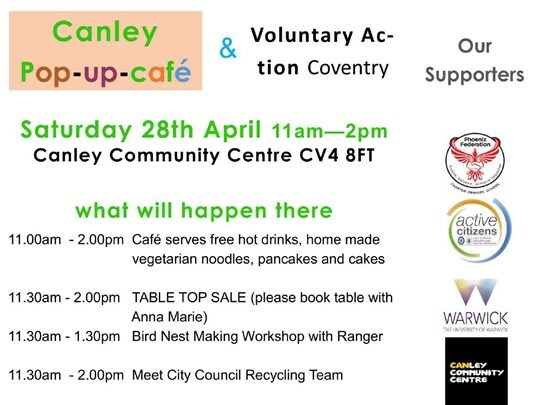 We will be at the Canley Pop up Cafe on Saturday 28 April between 11.30 & 14.00 come and talk to us if you have any questions about recycling and home composting. We’ve recently been to a number of schools to talk to students about the three R’s but have you ever wondered what do they actually mean? Reduce - when we talk to students about rubbish we often ask them to start by reducing their waste. A good example of this is the use of reusable shopping bags as a means to reduce the amount of plastic they are using. However there are many other examples of things you can do. When out shopping especially for food it can be useful to make a list of what you need to buy to reduce the purchase of unnecessary items. Reuse – Many items can be reused before being thrown away. Water bottles can be refilled and taken to work and school. Glass jars are great storage solution. An old envelope can be used for writing a shopping list before going food shopping. Often items of clothing or furniture that are still in good condition can be resold or donated to charity. Recycling is last step in the three R’s process. Ensuring items that can be recycled go into the right bin ensures they can be made into something new. We’re interested in hearing your thoughts on recycling you can use our new comments feature below to submit your recycling top tips. We will be at the sustainability market at the Lower Precinct on Saturday 10 March 9am - 5pm. Come and ask us your questions about recycling and home composting. Would you like advice on home composting or recycling at home? 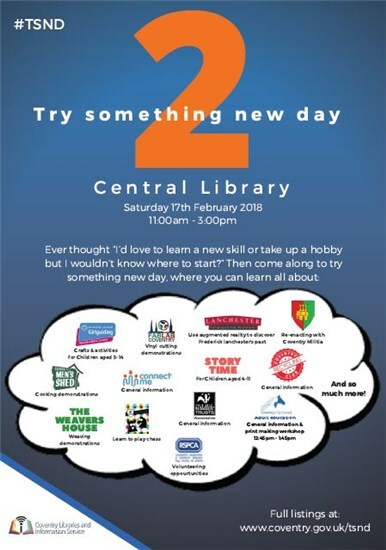 We will be at the Try Something Different Day Saturday 17 February 2018. Do you have any questions about recycling? Since the introduction of plastic bag charges the use of single use carrier bags has decreased more than 85% this is fantastic news. Keeping reusable bags in your car boot or work bag is a great idea for cutting down unnecessary plastic waste. 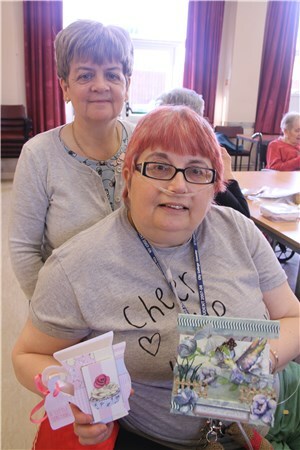 There are a number of options available for reusable bags as they come in a range of materials and sizes. Another tip while out shopping is avoiding any unnecessary Buy One Get One Free offers ensuring items can be used before they go off which will cut down on both food and packaging waste. Reuse drinks bottles to cut down on plastic waste. Charity shop will often except donations of furniture, toys and clothing if they are still in good condition. Pre-loved items can even be sold or given away through a number of different website. There are a number of items that you can recycle at home from your kitchen. 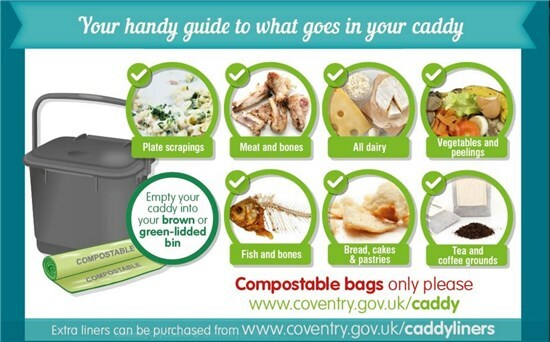 Food Waste - You can now recycle your food waste using your food caddy. 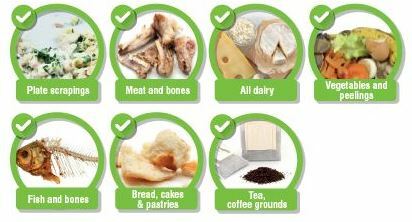 All your cooked and uncooked food waste can go into your caddy. The caddy can be lined using a compostable liner or newspaper alternatively you can put food straight into it. Once your caddy is full empty it into your brown lidded bin. Know your dates - A lot of food is thrown away across Brittian making sure you know the difference between what dates mean on food labels as it is really important and can help you waste less. "Use by" - is used for safety guidance. Food should not be eaten after its use by date as there is a safety risk. It can however be used or frozen right up until this date to be used at another time. "Best Before" is used as a guide in relation to the items quality, you can eat something after this date however it may not be at its best. "Sell By" or "Display Until" are for the retailers reference and refer to internal stock control. Further information on making the best use of leftover food can be found be visiting love food hate waste. 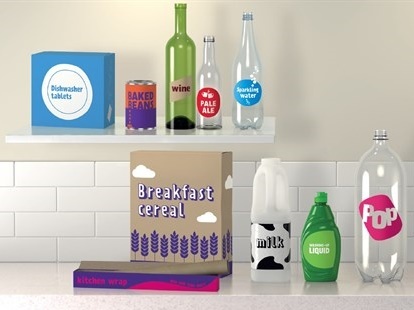 Cardboard -including Cereal boxes, washing powder boxes, cardboard sleeves all can go in your blue topped bin ready to be recycled. You can also recycle Takeaway Pizza boxes as long as there is no food left in them and the card isn't greasy. 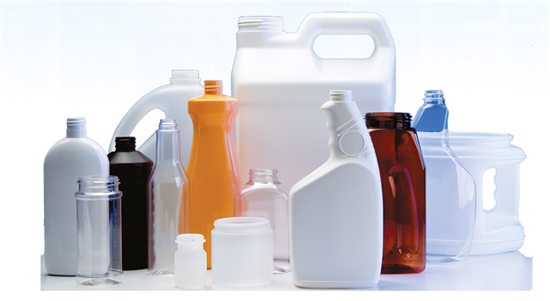 Glass bottles / Jars - Rinse any glass before you recycle them. Lids and tops can be left on however corks should be removed. Natural cork can be composted by slicing it thinly and placing on a compost heap. Many plastic can be recycled including bottles tubs and trays. Remember to wash and squash any plastic items this will make more room in your recycling bin. Plastic films however need to be disposed of in your green lidded household waste bin. Metal food tins including pet food tins, larger tins used for storing biscuits and sweets can also be recycled. Drinks cans can also be recycled. 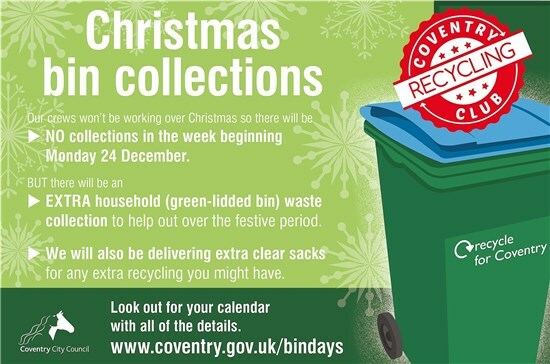 Remember, bin collections over the Christmas week will be taking place a day later than your usual collection day. 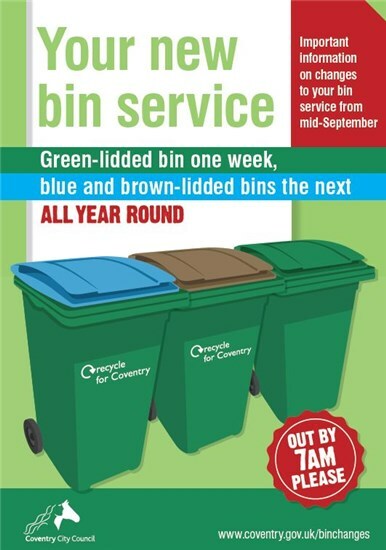 Be sure to check your calendars carefully, or see www.coventry.gov.uk/bindays for your day! Merry Christmas from Coventry Recycling Club and best wishes for 2018! We've been busy over the summer running a number of roadshows across the city introducing residents to the new food waste collections. We've visited a range of venues and its been great to able to offer advice to our local residents. We'll be advertising new events on our events page as the arrive to keep checking for further information. We asked one of our master composters for some feedback on how they were getting on composting. Here's what they had to say. "Here is a photo of my lovely compost! I got the Green Johanna composter last November and, hey presto, here is the lovely compost. It is quite chunky so I could sieve it if I needed it to be finer. A really good sign is that it was absolutely packed full of worms, big and little. That means the adult worms must have found it suitable to breed in. A compost full of life means it will be great stuff for the garden. I planted some Early Purple Sprouting Broccoli seedlings in it. Fingers crossed they grow bigger before the slugs find them!" Over the next couple of weeks you'll be receiving information about the new bin service through the letter box. Look out for your leaflet about the chages. Newspapers, card and magazines can all be recycled in your blue lidded bin. You can opt out of receiving junk mail. By registering with the Mail Preference Service (MPS) can have your name removed from advertising lists and is supported by the Royal Mail. More information can be found here. The Royal Mail can also help you opt out of unaddressed mail, more information of how to register for this service can be found here. Glass and plastic bottles can be recycled in your blue lidded bin. You can even compost any cork bottle tops in a home compostin bin. Toilet roll tubes can be recycled or can be reused to plant flowers and seedlings. The rolls are compostable so can be planted straight into the ground eventually breaking down. They are also a great item to add to your compost heap. Empty glass bottles can be recycled. Any unused, unopened and out of date medicines should be returned to pharmacies for safe disposal. 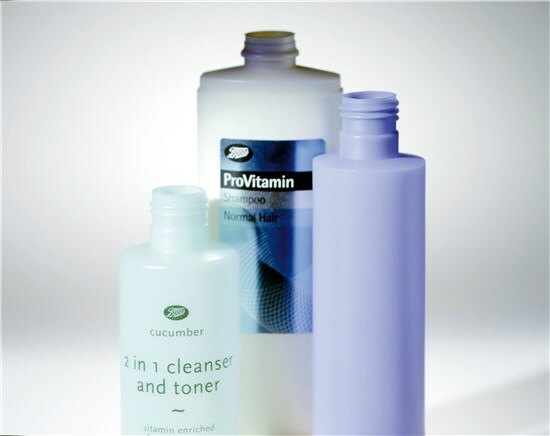 Plastic shampoo and shower gel bottles can be recycled however please rinse and squash them before placing them in your bin. Top tip: to try and help you recycle more items from your bath room try hanging a small reusable bag off a coat hook. Fill it with all your recycling waste then transfer to your blue bin once full. If you have any questions about the new waste service or how to use your food waste caddy we will be at a number of roadshows across the city. Please check our events page for a list of where we will be. Your new waste collection service will start next week. Please read through your new waste collection calendar carefully as your collection day may have changed. You can also now compost your food waste in your brown lidded bin all year round. Simply use your food waste caddy to separate all your food waste and once the caddy is full empty it into your brown lidded bin. You can line your caddy with a compostable liner, sheet of newspaper or alternatively put the materials loose into your brown lidded bin. Much of our household waste comes in the form of packaging. 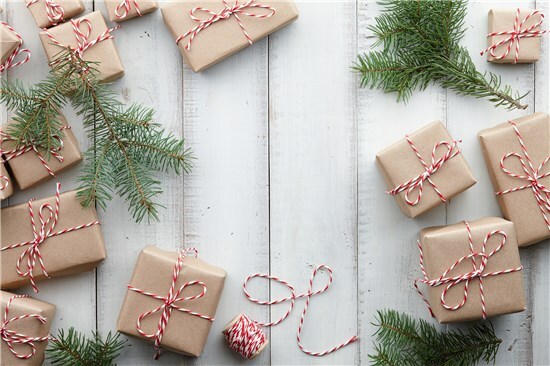 Here are some tips to cut down on excess packaging waste. Foil wrap can be washed and re-sued. Visit our home composting page fro more information about special offers available on food digester's and compost bins. International Compost Awareness week starts on May 7 to celebrate we'll be at Coventry Central Library May 10 between 12-4pm and at the War Memorial Park Educational Room May 13 between 10 - 2pm to talk to you about how you can get started composting. Thank you on behalf of our most recent good causes. We've been able to award Coventry Cyrenians £875, 33rd Aldermans Green Rainbow Unit £525 and St Catherine's Church £350. There are a number of ways you can reduce your waste out put at home. Shopping lists are a great way to plan ahead and prevent you from buying things you may already have at home. Love food Hate Waste has a number of ways to help you combat your food waste including left over recipes and hints and tips. Did you know approximately two million tonnes of clothing waste is produced every year. Much of this waste could be reused. Before you throw something away consider if it can be resold, altered, swapped, given to charity or even reused as rags. You can also cut down on your paper waste by opting out of paper mailing lists. In September we offered each primary school in Coventry an educational workbook for every pupil in year five. 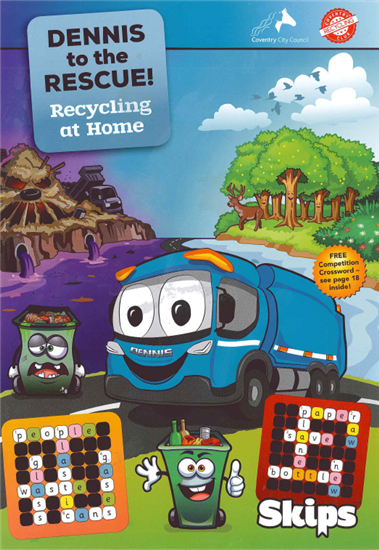 The book focused on teaching children the importance of recycling and living sustainably and was produced by Skips Educational. 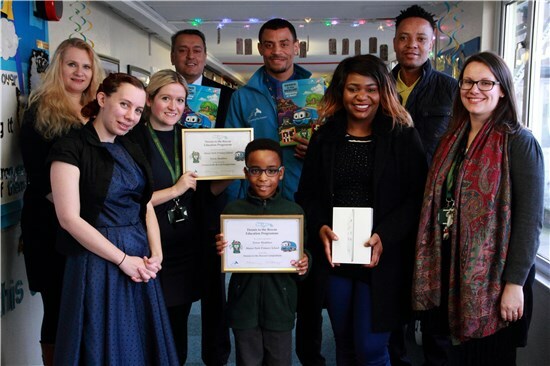 We recently visited Tyrese at school to present him his ipad mini and certificate. Go Green Week will be happening 6 - 12 there are a number of events planned for the week. Visit the website for more information. We'll be at the Lower Precinct on March 11 along with some of our Master Composters. Come and talk to us about how to start composting and for information on what you can recycle at home. assist-Mi and CSWDC are excited to announce that the Coventry & Solihull Waste Disposal Company on Bar Road has joined the citywide assist-Mi app pilot, allowing disabled users the ability to request assistance in advance of turning up at the recycling centre. The assist-Mi team have been working in conjunction with Coventry City Council to make their revolutionary disability access solution available at over 55+ service providers in the Coventry area including the Herbert Art Gallery and Museum, the Central Library, all the Council Offices and the Belgrade Theatre. 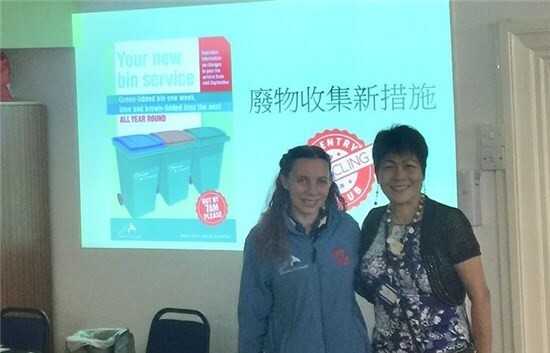 The Recycling Centre is the latest service provider to join the pilot and it means that users are able to request assistance when turning up when recycling their unwanted items and waste materials. They are also able to view contact information for the site, and talk to staff via a two-way messaging functionality in the app. Have you ever wanted to try something new? We'll be at the Central Library on 4 February to talk about home composting. Please see the poster below for more information. 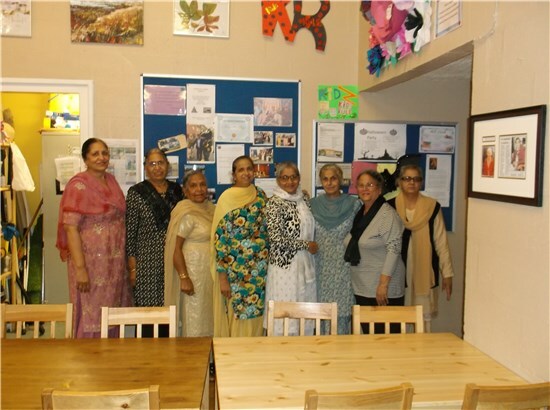 Thank you from Stoke Heath Older Peoples Club thanks to your donations they will receive £300 funding. Garden waste collection have restarted across the city. You can check when to put your bin out here. If you have a child in year five we hope you've enjoyed our Dennis to the Rescue workbook. The books were design to help introduce primary school pupils to the importance of recycling. If you have had chance to make a Dennis the Dustcart we would love to see the results email or tweet them to us. This year we are very thankful for our Master Composters who have helped us at a number of events across the city. We recently had an evening to celebrate Christmas and share ideas. We'll be planning some more road shows in the new year to talk about both recycling and home composting. 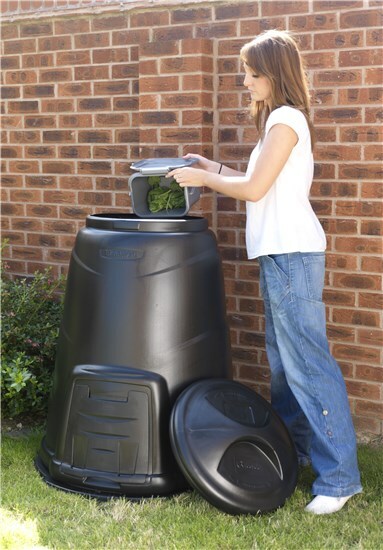 If you are looking to start composting we still have compost bins available for as little as £5 excluding p&p. 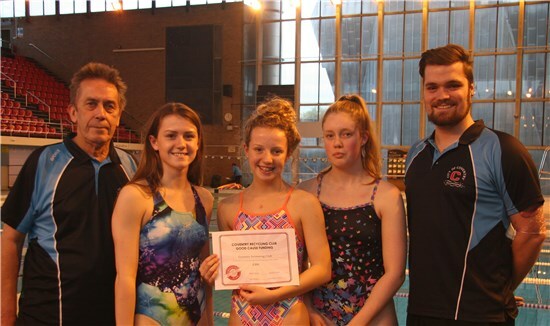 Thank you from our recent good causes Coffee Tots received £750, Coventry Swimming Club £450 and the Positive Youth Foundation £300. Do you ever forget to put your bins out? Maybe you're sometimes unsure whether to put out the blue-lidded recycling bin or the brown-lidded garden waste bin? Or are you ever unsure whether you can recycle certain items of rubbish? 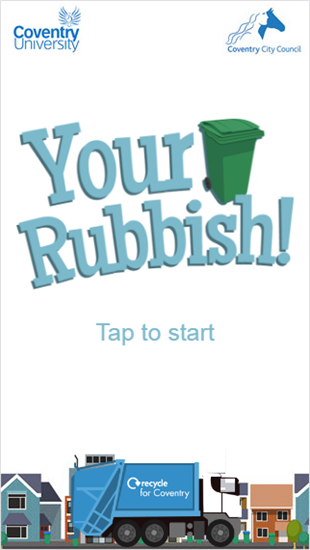 Your Rubbish, a new smartphone app has been developed by Coventry University in partnership with the Coventry City Council helps all residents living in Coventry know what, when and how to recycle and dispose of their waste. Two weeks ago we held our first Master Composters social evening. 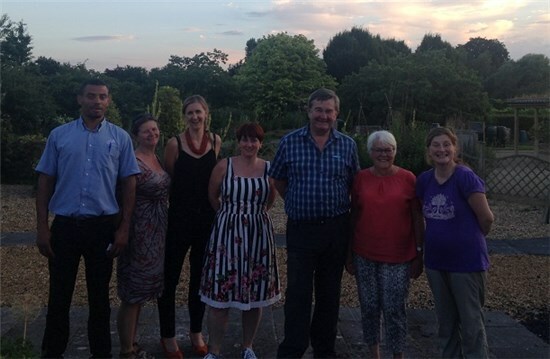 The evening was attended by five of our volunteer Master Composter and waste officers from the Council. 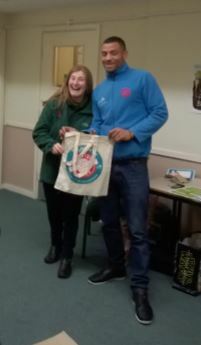 Garden Organic hosted the fun social evening, where Master Composters shared their stories and achievements, helped to plan future events and promotions, and gain a bit of extra knowledge. This time the training session focussed on weeds! Refreshments and super made for a pleasant evening in the sun. Are you are interested in becoming a Master Composter? If the answer is yes then why not look out for our next recruitment drive coming this autumn. It is estimated that around 39% of household waste in Coventry can be composted. Why not learn how to make your own compost, and help in the fight to reduce the amount of waste we produce. This course is available to Coventry residents and is a great way to learn how to put biodegradable waste to good use. 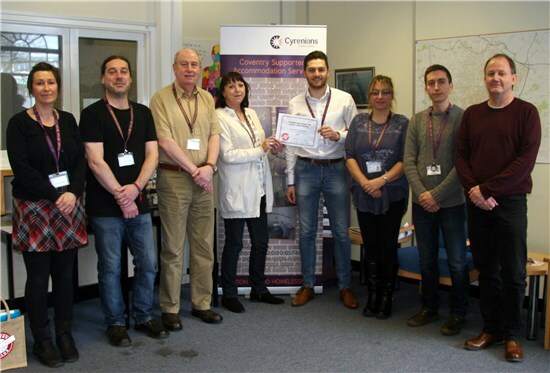 The Master Composter Programme operates as a partnership between Garden Organic and Coventry City Council, all training is fully funded by the Coventry Recycling Club. As part of the program you are required to give back 30 hours of your time prompting composting in the community. This can be done by yourself or in support of Coventry Recycling Club events. Maybe you have an event coming up you would like the Coventry Recycling Club and or Master Composters to attend. Why not email us at recyclingchampions@coventry.gov.uk. As part of International Compost Awareness Week, Coventry City Council is encouraging more residents to get composting with a fantastic offer promoted in partnership with getcomposting.com. 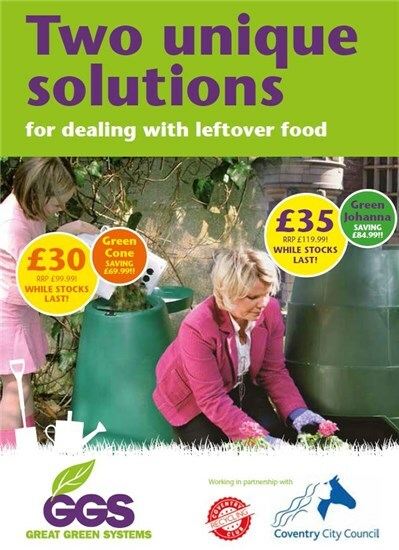 Residents can purchase discounted compost converters from as little as £17.98 and with the fantastic “Buy One Get One Half Price” offer, residents can purchase a second compost converter from only £8.99 (RRP £39), a massive saving! Home composting is an easy and effective way of recycling some of the daily waste we produce, while providing significant benefits for our gardens, reducing waste sent for disposal and improving our carbon footprint. It is simple to do and once you get started, you will be surprised at just how much daily household waste can be recycled. Home composting also has the added benefit of producing a FREE supply of top quality compost that will put some life back into the garden. 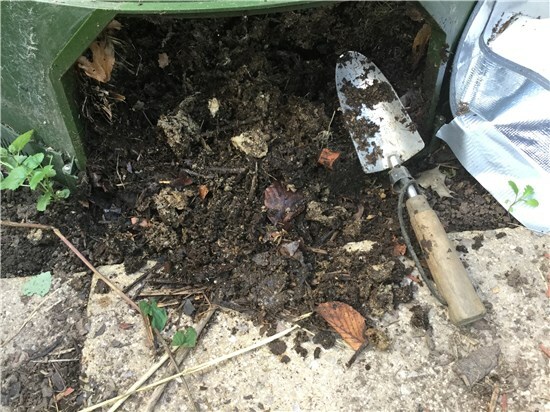 When garden waste is collected by Coventry City Council’s Waste team, it is taken to a local open windrow composting site in Brinklow and turned into soil improver. This is then used by farmers as an alternative to fertiliser. The process takes around 6 weeks. There are a range of compost bins and accessories available to suit new recruits and seasoned gardeners alike. For full details or to order visit www.getcomposting.com, or call 0844 571 4444. The buy one get one half price offer is available on selected products. A one-off delivery charge of £5.99 applies. Coventry branch co-ordinator for Guide Dogs, Frank Lynn, said: "This is great news - I didn't realise we were so popular. All money raised locally is allocated back to the Coventry Mobility Team based in Leamington, however this donation will be used for a special project. As part of the Godiva Puppy Appeal we are running, we are going to name our next sponsored puppy 'Jimmy' after the legend that was Jimmy Hill, and this will kick start the name a puppy fund for 'Jimmy'. 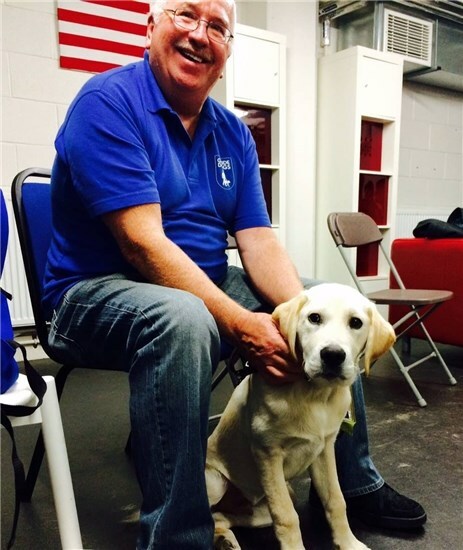 'Jimmy' will be placed with a puppy walker locally, and in time, potentially form a guide dog partnership in the area as well, which will reduce the current waiting list for guide dogs in Coventry." The next set of good causes are now live and looking for your support. New game - have you played it yet? 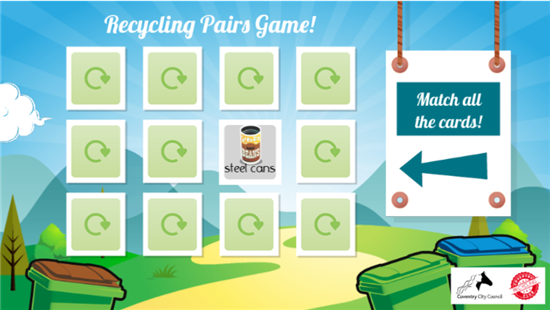 Earn extra points when you play the pairs game. Match them all up and earn 100 points! 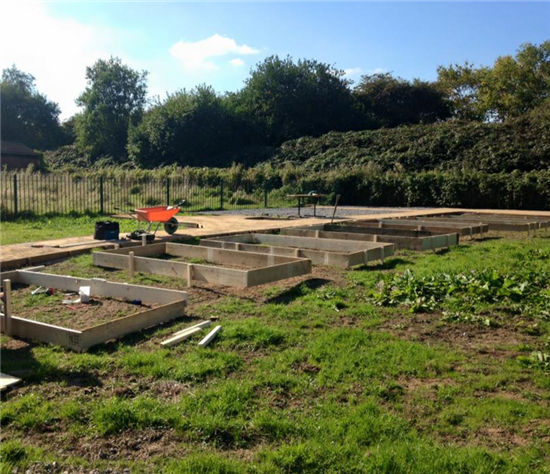 Laura, who works with Gosford Community Garden said "That is absolutely great news! Thank you so much. We can start work now on our next leg of the project!" Thank you for supporting Good Causes. 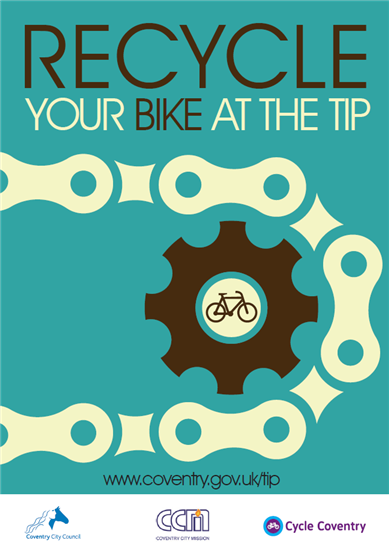 Thanks to the success of the bike recycling project you can now recycle your bike whenever the Recycling and Reuse Centre (the tip) is open. You no longer have to wait until the last Saturday of the month. Bikes dropped off at the Recycling and Reuse Centre (the tip) on London Road will be refurbished for re-sale in the community by Coventry City Mission to encourage more people to cycle by making it more affordable. 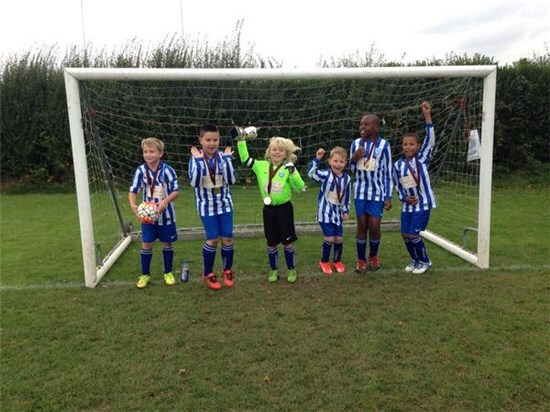 Any profits will go towards Coventry City Mission's work. Dates on food labels are there to help us use food when it is safe and at its best. By understanding what the dates mean we can take control and make really effective use of the food we buy. Confusion over date labels is common. Just under half of the good food and drink that we end up throwing away (worth £5.6 billion) is because we don’t use it in time: thrown away because it has either gone off or passed the date on the packaging. By getting the dates to work for us, we can eat safely, take control, and also save money. The ‘Use By’ is there for your safety and is only found on foods where there is a safety risk. Therefore food should not be eaten past this date, but it can be eaten or frozen right up to it. The ‘Best Before’ date relates to quality – it will be at its peak condition at this time – food will still be safe to eat after the date, but it may not be at its best. The ‘Sell By’ and ‘Display Until’ dates are just for the shops for internal stock control not shoppers so they can be safely ignored. For hints, tips and recipes on how to make the best of the food that we buy and save up to £60 a month, visit lovefoodhatewaste.com. If you're getting back in the garden this spring enter our latest competition to win a garden centre voucher. 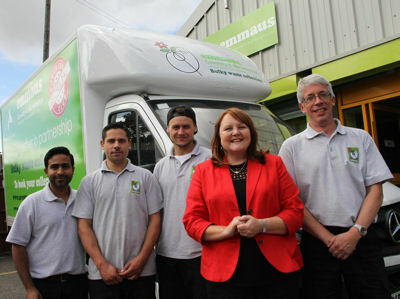 We've linked up with Emmaus Coventry and Warwickshire so your unwanted furniture and electrical items can be re-used and at the same time help formerly homeless people. Items such as sofas, wardrobes and dining tables collected as part of the bulky waste collection service which are reusable, will sold in Emmaus’ shop on Red Lane raising vital funds for the charity. The charity provides formerly homeless people, known as Companions, with a home, food, basic essentials and full time work. Items which cannot be sold will be recycled. Cllr Lancaster, Cabinet member for Public Services, said: “For a small fee, residents can get rid of their unwanted pieces of furniture or electrical goods and these can be sold to benefit a great charity. When you book the service, if you say that the item is suitable for re-use and you are a member of the Coventry Recycling Club you will be awarded 100 points. The bulky waste collection service operates six days a week (Monday – Saturday). Up to five items costs £26.25 with 20% discount for people on qualifying benefits. Master composters are volunteers who support and encourage others in their community to compost or start composting. Anyone can be a master composter, you don’t have to be an expert as you will receive training in ‘how to compost'. We will support you as you spread the composting word through working in the community, talking to local groups, attending events and even encouraging family and friends to take up the challenge! We would like you to lead the way encouraging others to compost. Training is free and covers the basic elements of home composting and related environmental issues. It’s not just training that you will receive, we will support you! You will receive a volunteer manual and updates, free Garden Organic membership, volunteer name badge, access to the compost website and a friendly voice at the end of the phone for support and advice. In return for your training we ask that you spend at least 30 hours a year promoting compost activities in the community. That's around 30 minutes a week! Don't waste your waste - Compost it! Don't look at it as waste; your old garden debris has the potential to give you a free supply of top quality compost with very little effort. Simply throw it into a compost bin and over the winter months it will rot down to produce environmentally friendly compost that when added to the garden will suppress weeds and retain moisture throughout the dry months. 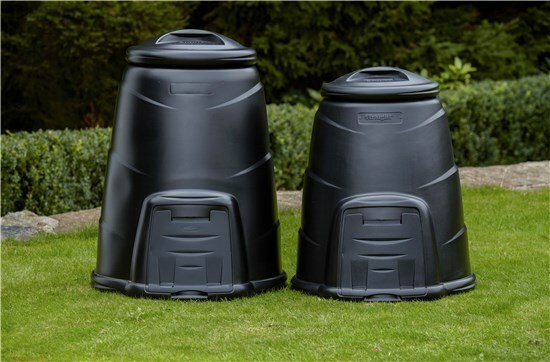 To encourage residents to get composting we've teamed up with Getcomposting.com to offer home compost bins at special offer prices from only £17.98. There is also a buy one get one half price offer to purchase a second compost bin from only £8.99, a massive saving! There are exclusive offers on a range of other great green products, including water butts and garden accessories. To see what's available visit www.getcomposting.com or call 0844 571 4444.